We Eloped! Click images for larger view. What a day, it was incredible. I cannot divulge faces yet as no one has been told. But I got some of the most amazing photos, the sun was setting over the blue ridge and was filtering through her hair and netting of her skirt on her wedding dress. I could not have asked for a more excited happy and loving couple. When it's good, it's real good! I am not the photographer JB is but thankfully everyone has been OK with what I have taken so far. Here is today's couple. I love that we're getting couples of all ages, dressed up & dressed down. I even get them barefoot. Love it..but I would like to see it in original colors. I want bright and brilliant. Though this is another alternative that is cool too. You may be in the minority. Most of the brides don't want bright and colorful. I like bright and colorful, as you know, I love it! Here is an example I made last night. I let them do whatever they want to do with the photos. I edit a few for them, and give them the tools to use. So yes whatever you prefer you can do. Well in this example I have to say the after is better. I guess it just depends on the look you are after. Agreed. I love vibrant colors, I am all over wanting the photos to be bold and brilliant, but it depends on their apparel and looks as well. She wore braces, in her mid 40's so that was a major challenge for photos. Major. When she tried to hide them it was worse than when they showed, imo. Our faces change, so covering them up at 45 is a lot diff to 13 or 14. I wont' post any of those, but trust me. I have a few of her pulling his billy goat! I'm so happy that these elopements are putting some much-appreciated extra cash in innkeepers pockets, and I think you're enjoying doing it, too. A nice diversion from years of innkeeping (not that innkeeping isn't something new every day, too)! with all the other photos being here, I wanted to add one of mine. This is the Thursday couple (he goes by Van not John) Van & Becki at my house after the ceremony. I friggin' LOVE her dress. Very sweet and the rhodies look great as a backdrop! K if you want any photos for future marketing, send them to me in a large file size, if you have their permission to use them. Thank you. I never publish, even here, without permission. That would br great and appreciated. Have another June 10 (IT was supposed to be next until this one called). I'd say you have a new, growing niche for your B+B. Your energy, expertise, location and attention to detail make you the PERFECT host for elopements!!! Congratulations! What a great job you're doing! Doesn't doing these just put a new spring in your step? Yes, I am loving the happiness factor. The B&B has lost the happiness factor, as mentioned a no-show and a dog in the room this morning, so the spring is there! It is stressful being the photographer, and having to direct the whole thing, as I want to make sure I get great photos they will cherish forever. And I need to ice my arm afterward if they added on an hour of photography. But it is my own pocket change for that, so it is nice. That is why I video the ceremony and do photos before and after. Our next one is June 10. I think the article I got in the Charleston paper diffused things when it ptrinted a list of of a dozen others that are supposed to be doing elopements. Photography is also your THING!!! This wedding niche should bring you lots of success. Put a portfolio together and you may have yourself another career Beautiful! another one today...he began by bending a knee and sharing a personal vow and got everybody all teared up. Their three sons were here for it, one walked Mom down the path. It was really neat. Glad it's really going great! Your hard work and planning pay off. That's a bunch of folks for an elopement. Any additional rooms rented from this? Nope. The three sons were here, one was a surprise, then they left after and all went out to dinner together. We did have a dog in another room this morning, pretty easy to spot when the guy takes him out to drop his #2 outside the kitchen window while I am cooking. We also had one no-show last night, we were full and people wanted rooms, and then this one no=showed but I did already charge their card. I was up at 2am every 15 minutes unable to sleep til my 6am wakeup this morning when I took the note off the front door. This is what I want people to know, this is from a photog who works at a B&B in Texas, and comes highly recommended. The photos are so important. Another elopement here, it was raining so we held it on the porch. We had our third elopement. Each one is amazing and so full of love and joy (it is the icing on the cake). I am not sharing their photos "out there" yet, so here are a couple for your eyes only (not of their faces etc), but general elopement happy photos...they look young in these pix but are in the middle 30's *fyi. wow!!!!!! . you blew me away with your photos. GREAT ! Job well done. I am sorry but have no idea who they are. Or who the others are either. Guess you all must know them in your neck of the woods. Either way I would over the years cherish pictures like that. No they are not anyone famous, just giving them privacy by not showing their special day before they share it with family and friends. They are still here, I went to fresh their room and heard laughter... I left the towels outside the door. This morning they were having coffee and making grand plans for the rest of their lives together. it was pretty neat. It is hard to believe a full week has passed since this elopement. I am now able to share photos of their faces, and although I don't want faces as such in our marketing I do want you to see what I saw, the look on the groom's face here, you will understand what a blessing this first elopement was to DH and I. 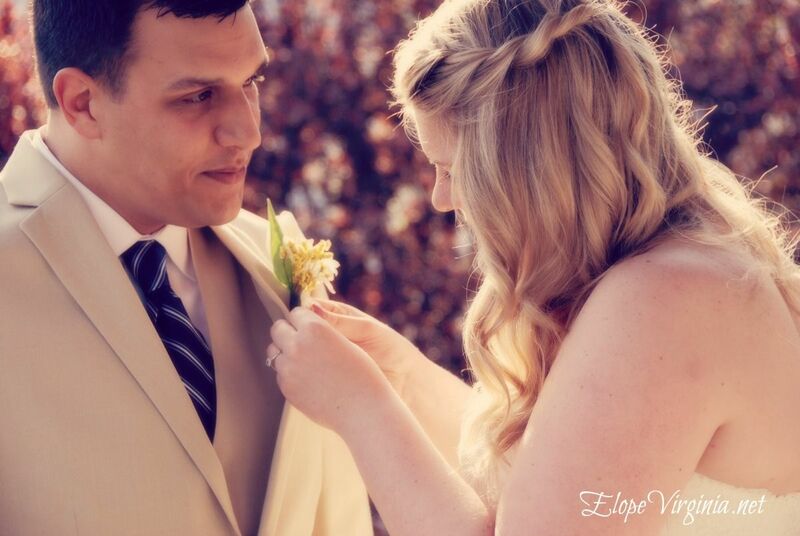 He is seeing her for the first time and she is pinning the boutonniere on him here. That photo made me tear up. Oh....WOW! I can understand not wanting too much of your marketing with faces, but this one...THIS ONE...oh, it should be included. That is an amazing look. I wonder if he has a brother? ROCKY MOUNT YOU DID IT AGAIN! We had guests here at the Claiborne House Bed-and-Breakfast getting married. After an elegant elopement ceremony at the Claiborne House, they took beautiful wedding photos and had cake and a toast on the porch. Then they proclaimed a change of plans, instead of the fine dining meal they had anticipated, they just wanted pizza! I recommended they go around the block or cut through High Street Cemetery and go to Hema’s Italian Restaurant for some great pizza. At Hema’s they were treated so kindly, the owners brought over a special dessert and sent them home with extra goodies in their doggy bag. At check-out the next morning here at the Inn they told me about all of this, about all of you and what you did for them and it brought a little tear to my eye. They had never experienced small town southern hospitality before, and you knocked their socks off! Thank you to the person or couple who paid their tab, you will always be a special part of their memories made here by this happy newlywed couple from Norfolk Virginia. Rocky Mount you did it again, and I could never be so proud! You could not have planned that....what a perfect ending to a perfect day! PS Forgot to mention Arks, I sent you a few photos (showing the Bride and Groom) to pass on to your friends there. Si señora. Got them and passed them on. Thanks! Can't wait to see the pictures. Congratulations on a job well done. Small elopement packages seem to be going well for those of you in the mid-Atlantic. I am emulating our innmates from the forum in Texas, Missouri and Louisiana. So they are doing well, there is one on this forum about to have their 100th elopement! I am so proud of them, they are amazingly wonderful! if it works for you and the customer go for it - definitely a market for smaller less cripplingly expensive weddings! especially for renewals or 2nd times round. Lovely photo. Out of curiosity, how many were there in the wedding party? Elopement. What you saw in the photos. The officiant looks like he might be familiar?